So as I mentioned in my last post, I was feeling a bit tired and under the weather- a sore throat and general achy bits. I was going to volunteer at the Hatfield 5 race on Sunday, but I didn’t want to sign up and then not make it, so I decided to err on the side of caution. I’ve moved the diffuser into the bedroom and have been adding some eucalyptus and peppermint oil to it to help with breathing overnight (you can put it on for 1, 3 or 6 hours but it cuts off when it runs out of water). I had a meal out with friends on Thursday (which was lovely, and probably better for me than having a run after work, but did mean a late night) and straight away noticed banana and nutella mini calzone on the dessert menu (plus any hot drink), so I decided to have a small pizza with salad to save space for them. Well, when it came, it was massive! I know it isn’t the size of a calzone you would have for dinner, but still. 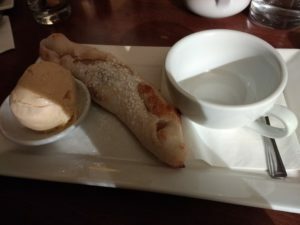 It also came with ice cream (I don’t remember reading that, but maybe it was on the menu), and I had a peppermint tea too- a very delicious end to the meal. 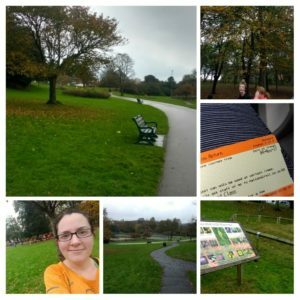 On Friday I was still feeling pretty tired, and decided that running parkrun may not be sensible. I quite fancied tail walking, so I looked around at the local ones and found that Westmill had hardly any volunteers and no tail walkers. I emailed them first thing, but didn’t hear back. Later they put a plea on facebook- I told them that I had emailed to tail walk, but by then they had filled the slot, and they asked me to marshal. Although I fancied walking at the back, or gentle jogging, the guilt got the better of me and I agreed. It was freezing! But so pretty with the frost all over the fields and trees, and the ponds frozen solid. I’d only run it once before (it’s fairly new) and I did worry a bit about being sent to a marshal spot somewhere and getting lost but thankfully they gave me a spot by the car park. It meant I could hang around the start area and chat to people as they came. 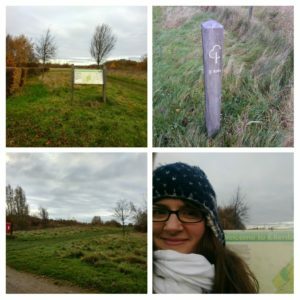 I ended up chatting to a couple of tourists from Stevenage that had relocated from Milton Keynes- it was good as they had been to quite a few parkruns that I had also been to, so we could compare notes. They reminded me about the Letchworth parkrun coming next year- I’ll need to run it to keep my made up Queen of Herts status! After they headed off to the start, I took a few more photos and stamped my feet to try and keep warm. Basically, the course is just under two laps- the runners meet at the finish for the new run briefing, and then walk up the track to the start. They then complete one lap, running past the finish, up past me where I directed them back towards the start to begin their second lap. 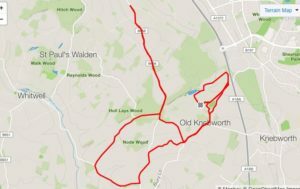 There were only 49 runners (it’s a small parkrun generally and I think the cold weather kept people away) but all were so friendly, thanking me on their way up the long hill. The tail walker went past just as the first runner finished, so I wandered down to the finish area for a bit and then as I could not feel my toes, headed back to the car. After breakfast we walked the long way into town (to walk in and home is about 3 miles, but we walked 3 miles to town, then around and then home, so probably more like 5 or 6 miles). 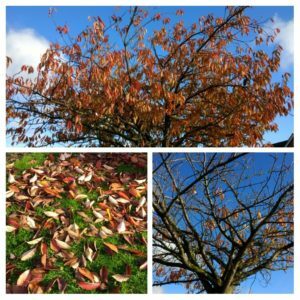 I picked up a Starbucks free drink (green tea latte this week), and after lunch we spent about two hours raking up leaves and filling the compost bins, garden waste bin and several sacks – the snowdrift of laves behind our cars were even bigger! Once it got dark I went inside and made a pumpkin pie for Sunday tea. In the evening we went to see Paddington 2, which I totally loved. I was feeling a bit rubbish though- quite cold and sat under my coat the whole time. I felt a bit groggy when I woke up on Sunday and felt like I really needed some fresh air to clear my head. I thought I would just head into town do a small loop and come home. 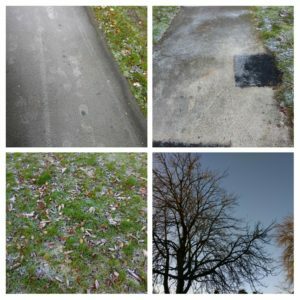 4 miles took me 50 mins (lots of stopping to wipe my nose)- the pavements were so frosty and I could see footprints in the frost. After breakfast we walked into town a different way, got a clementine hot chocolate from Caffe Nero to share for the walk home (so tasty), and stopped off in Morrison’s to get some sugar as I was going to make some marmalade. 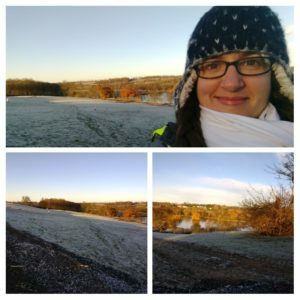 6 miles walked – not bad! 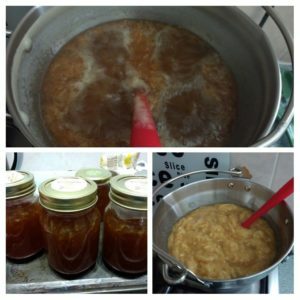 Last year for Christmas I was given a kit to make marmalade- a tin of lemon peel and things, and some jam jars. I decided after seeing Paddington that the time was now to make it. I’ve added in some chopped crystallised ginger to make lemon and ginger marmalade- hopefully it will be good (it smells lovely). 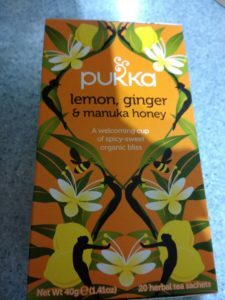 To try and clear my cold away I’ve been having lots of this tea- it is so lovely. How do you get over a cold? I know that resting is good, but also fresh air really seems to help but sometimes it’s hard to find the balance and you only realise too late that you’ve tired yourself out too much. Do you enjoy marshalling at parkrun (or races?)? I find it quite fun cheering everyone on, but I would rather do it in the summer when it’s too hot to run. Bits and bobs and a headstand! So, a bit of a random post coming up! I’ve not managed to get to a club run in a while. We’ve had half term (I went out in the light in the morning), the next week I got back too late from work so went out on my own. Last week I finished work earlier, and the traffic was awful so I went out on my own (it was nearly light when I left! )- it seems like no-one actually managed to get to the meeting point as traffic was gridlocked, and then this week I was still stiff from the half marathon (plus the run leader wasn’t going to be there) so I just ran into town to get some cash out and then ran home- that was enough. Hopefully next week I’ll get there. Yoga has been good- last week we focused on twists (we focus on something different each week) and also had a bit of headstand practise- I can now get both knees onto my elbows but the final push to stretch out the legs is so tough (and a weird feeling- it’s hard to work out which muscles need to work when you are up-side down). Josie, the teacher, came over to gently hold my hips to steady me, and then I managed to get both feet up! I didn’t hold it for that long, but it was a great feeling of accomplishment! I don’r even think I ever managed one when I was a child in my gymnastics club. This week I was feeling grotty (I’ve had a sore throat since Sunday and a stiff neck, and have been losing my voice) and I wasn’t even sure I would go. I am really glad I did- we focused on inversions so it was a little gentler than usual. Although the headstand we did was the other one (with elbows on the floor) so I am much further away from managing that one. I felt so much better when I got home- the final relaxation part was bliss, with some geranium oil to help with the focus. Things are starting to get busier though- we’ve had a few extra staff meetings and this has meant running being pushed to one side (last week I went to a cluster meeting at another school, which was great, but it meant I got home later. I could have gone for a run, but I had work to do and knew that it would just mean a super late night which I didn’t really need). Today I’ve got an extra meeting and then am going out for dinner with friends, so there won’t be time for a run then either. I think as we get closer to December this is going to happen more and more! 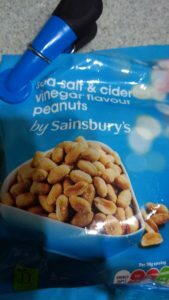 After my run on Sunday a few weeks ago I really fancied some salt and vinegar peanuts. When I first heard of these, I thought they sounded horrible. But then, I love vinegar and I love peanuts, so in the end curiosity got the better of me. They are so tasty- I don’t think they should work, but they really do. (Not good when you have a sore throat though). After having my chip scanned at the Brighton and Hove parkrun, I was given a leaflet with discounts by a member of the Vegan Runners club. 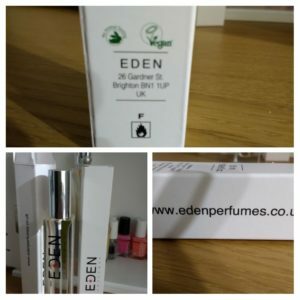 One of the places on it was Eden, a perfume shop. Now, I do sometimes get perfume from places like Lush or Yves Rocher, but I also do buy the gift sets in the January sales from the normal perfume places. I sort of knew that they might not always contain nice things (I put the thought of actual musk to one side), but I hadn’t given it a lot of thought until then. The shop is pretty amazing- on the wall are mounted loads of bottles- it looks like a bar (click on the link if you are curious as it’s pretty impressive I think). Each bottle has a description of the scent, and they had leaflets telling you “if you like this high street perfume, then choose this number”. I spent ages in there smelling the samples, and then bought a couple. You choose the size and then you can also have old bottles refilled for less- I think the bottles I got should have been £15 each but with the discount it was £13. I’m a convert anyway, so once my old perfume has been used up I will not be buying more from Boots. Is life starting to get busy for you? Which combinations of food do you think are wrong but actually work so well? Have you ever thought about what is in you perfume? 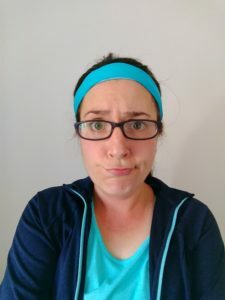 Author Maria RunsPosted on November 23, 2017 Categories General ramblings, Running2 Comments on Bits and bobs and a headstand! On Saturday I was off to marshal at Ellenbrook. I’d asked to be on one of the earlier points as my dad’s cousin was coming down from Milton Keynes to run it (we ran with him in Linford Wood earlier in the year), and we were all going to have breakfast together after. They had kindly accommodated me, so after getting my high viz, lanyard and instrument (I chose a cool looking rain stick from Peru), and briefly seeing Dad and Tony get off their bikes and Brian arrive from the car park, I headed off to my spot. It was a gorgeous morning- blue skies and not too much wind. I was glad I had wrapped up warm. I was looking forward to cheering on all of the runners- I don’t marshal very often as I do like to actually run, but of course the idea is that everyone takes a turn, and the day before a half seemed a good day to rest. Ellenbrook has a small loop to begin with, and then a larger loop, so I was on Marshal point 2, directing runners first back towards the start (they turned left), and then on their next lap a right turn towards the fields and the bigger lap. As I was waiting, one of my friends, Elaine, turned up, walking her dog. She marshaled last week (taking the excellent flying feet photo) and as she was running a race on Sunday she had decided to walk while her daughter was handing out the tokens. She took photos of the runners as they came through the second time- one of the OH ladies was running her 100th parkrun (and got a pb too!). I commented that usually the front runners don’t lap the tail walker, and then low and behold, as the tail walker came into view so did the front runner, steaming past. I had an arrow so I had to do a bit of jiggling to show them which way to go (left on the first lap, right on the second). Once they had gone through we walked back to the start, just in time to see Brian and Tony finishing. It was so cold so we didn’t hang around for long. 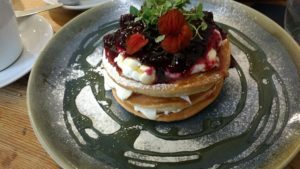 We then had a lovely breakfast (pancakes- I thought Mum would do them an English breakfast but she knew I was coming so went for those instead) and a great catch up. Brian is a total parkrun convert- next week he moves into the next age category (75-79! 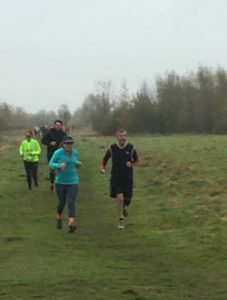 )- he’s pretty speedy but at his local parkrun there are two other guys in the same bracket as him consistently going closer to 20 minutes- impressive! Later we braved the rain to walk into town, and I did a bit of baking (caramel apple blondies) before an evening with the fire beckoned. 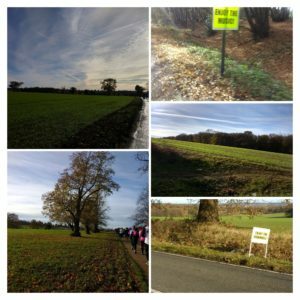 On Sunday I was running the Herts half marathon, at Knebworth, a big stately home and grounds by Stevenage. They have hosted big concerts there before (the one in the Oasis documentary) and the medal looked pretty cool. Anyway, I had heard it was going to be hilly so I was prepared to not chase a time but just enjoy the scenery. The race info told people to get there by 7.45, which seemed early seeing as the race number were posted out and the race didn’t begin until 9.30. They also said if you arrived after 8.50 you would have to use the overflow car park, 1km from the start, which I thought sounded fine (and sort of contradicted the advice of getting there so early). I live around 15 mins from the start and wasn’t planning on using the bag drop or the toilets, so leaving at about 8.20 am seemed to me like I had left plenty of time. But no, a mile from the exit of the motorway I joined the queue of traffic, and it was just barely moving. It took me 50 minutes to do that final mile- I finally parked at 9.25, to find out that it wasn’t a km, but a mile away (and according to google maps, more like 1.3 miles). I ran most of the way, and a lot of it was uphill- not a good start. At least I hadn’t planned to use the bag drop (it told you not to, and said keep everything in your car, but there would be an “informal” bag drop, whatever that means- do they say “hey” instead of “hello?”) but I did have to put my timer chip on my trainers as I hadn’t decided the night before which shoes to wear. As I got to the top of the hill, the race started with the speedy runners haring towards me (and all the people watching). There seemed to be a lot of runners so I managed to run around to the back (nearly tripping on a low fence) and put my chip on my laces and tried to take some deep breaths. A stressful start! Some people didn’t even begin until nearly 10am so I wasn’t the last by a long shot. So, onto the race. I had heard that it was hilly, but I don’t really know the roads around there at all. It was really tough. The first 6 miles went by OK- I was keeping a fairly steady pace and although I stopped to take a few photos, I didn’t feel I needed to. One sign said “enjoy the downhill”- not easy when you know you have to run up it later on… The “enjoy the music” sign was just before a guy playing a steel pan brilliantly which cheered me up no end. The course started in the grounds of the house, and after 1.7 miles (or according to the announcer, “2 miles on the dot”) we ran back through the finish line before heading out into the surrounding country lanes. We then had a long bit of out and back- you turned at 5.5 miles so I had a long time to watch for faster runners on the other side of the road. 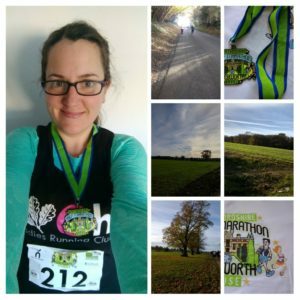 At around 6 miles I started to get a sore leg- this happened to me at the Bright10 in 2016- it felt a bit like my leg was twisting around. After that happened I kept having to stop and walk and stretch it out. I am not sure what causes it- I think perhaps running on a sloping road where one leg is constantly higher than the other. The hills were constant too- it felt like you were only ever going up or down, and a lot of it was fairly steep so the downhills were just as tough on the quads. I really struggled to keep going at times. I realised that I had left my clif blocks in my car (argh- what use are they there??? ), and at the final water station I took a bottle with me. I also spent a long time feeling grumpy as I saw all the discarded bottles and caps by the sides of the roads and in the bushes and woods- I really don’t like bottles anyway because plastic is just so bad for the environment (and it wastes so much water) but if they must have them, why not provide a bin??? I made sure I took little sips as my throat was sore from the cold air. Even the 10 mile point with just a parkrun to go felt like the end would just never be in sight. I ended up messaging Andy at one point while I stretched out my leg as I was really struggling to keep going. From my fastest mile of 9.37 (mile 5) I slowed to 13.08 for mile 10. With around 2 miles to go I started to see a few finishers with their medals, and could hear the announcer. At one point I could hear a band playing “Live Forever” by Oasis (there was a little stage at the finish area), but they didn’t seem to be playing all of the time. As you might be able to see on the Strava image above, the final mile was uphill (I’d already run it once on the run from the car park)- this was so tough and demoralising. The path hadn’t been roped off so I had to weave in and out of the people who had finished, wearing their medals, on my way to the top. When I finally finished the medal was handed to me, I was given a banana and a carrier bag, and then had to wander through and collect the items- a medium t-shirt because they had run out of small (grr), a little bottle of water and a clif bar. I sat on a little fence for a bit and ate the banana and just tried to summon up the energy to walk again. It was a really cold day (2 degrees when I left the car) and my hoodie was in the car- I had worn a long sleeved top but of course that was sweaty and not doing much to keep me warm. I put the t-shirt on and then saw lots of people with hot drink cups, so I found a little van selling hot chocolate and got myself a gingerbread one (although that seemed to mean it came with a mini gingerbread biscuit?- I thought it would be spiced hot chocolate). I saw a few runners from the club and chatted to them briefly (one of them managed to run it in under 2 hours!) but I was getting so cold and had a long walk back to the car. I also took one to show how much I hated it but Andy has said I really should use the happy photo instead- happy to have finished! Then there was more chaos as no-one was manning the car park (which was basically a field anyway), so I think I finally got home at around 1pm. I did some yoga stretches and then had a lovely hot shower while Andy warmed up some cinnamon rolls in the oven and made a big pot of tea- then I started to feel a bit more human as I slowly warmed up. So, I won’t be doing it again! But I think that with a few tweaks it could be a really good event- things like the photos were a nice (unexpected) touch. I didn’t do much for the rest of the day- we had a lovely baked sweet potato for lunch and then went to see Only The Brave in the cinema (which I thought was very good- based on a true story of a fire crew who tackle wild fires). I woke up on Monday with a really sore throat (and super stiff legs) so I do wonder if I struggled more if I am coming down with something. Are there races that you have said “never again” about? The “Great” runs are on my list. A parkrun in the rain, getting cold and finally using our fire! On Saturday I met Dad at Ellenbrook for parkrun. It was pretty miserable weather- only about 5 degrees and raining, so I sat in the car for a bit before finally braving it. Dad had driven (he often cycles but not surprisingly didn’t fancy it)- I was heading to theirs for breakfast after, so I told him not to wait but we ended up running together. I’d worn a visor to try and keep my glasses dry, but the rain was too hard. I didn’t even spot my friend Elaine (she was marshaling) until we called out “thanks” and she said “hello”- I recognised her voice but couldn’t see properly! Flying feet! It was slippery and very muddy in places, although the worst part (the “water feature”- a muddy track that is under water for a good 10 metres) has been filled with sand so it wasn’t so bad any more. Also, the cows were standing up. I thought cows sat down in the rain? Or is it when it is about to rain?? I had worn gloves and took them off after around a mile (my hands tend to warm up fairly quickly)- I did offer them to Dad as he had forgotten his and he really feels the cold, but apparently he wasn’t keen on wearing the flouro pink ones! Anyway, an enjoyable run, finishing in 27.44 and 1st in my age cat! That doesn’t normally happen (I think the rest of the people stayed at home in the dry!). I’d packed jogging bottoms and a jumper, so after driving to my parents I changed- I wished I had packed a proper change of clothes though as then I could have had a shower- not sure why I didn’t. 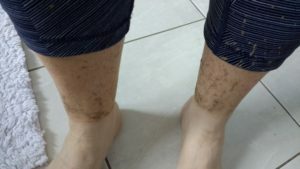 I had to spend ages wiping the mud off my legs- I thought I just had some splashes but actually it was a proper coating! We then had breakfast (pancakes of course)- my sister came around with her husband and baby, my brother was there, and Andy joined us later, so it was lovely to all catch up. 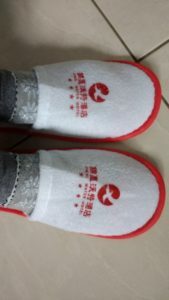 Mum lent me these slippers (from one of their hotels in China) so at least my feet were warm! In the afternoon we walked into town and I made some caramel shortbread for Sunday. Then after dinner we went to the cinema to see The Florida Project, which was really good. It’s set in the shadow of Disney World, following a child and her friends- they all live in motels and so it does show the struggle that the parents go through, but the children were brilliant and it was very uplifting at times too. On Sunday I didn’t set an alarm and didn’t even wake up until 8.45! Crazy! I headed on a run- I ended up doing 10 miles. I’d worn a top and jacket, thinking I’d take the jacket off after a bit and tie it around my waist, but in fact every time I considered it, the wind would blow more and make me feel chilly, so I kept it on the whole time. This is my “I wish I had worn a buff” face- my skin gets so sore and it looked like I had sunburn when I got home as the skin on my neck and chest was so red and itchy. After a shower it was time for breakfast- on Friday I had been into town (for a massage) and so I had of course had to go to Gail’s (an amazing bakery). 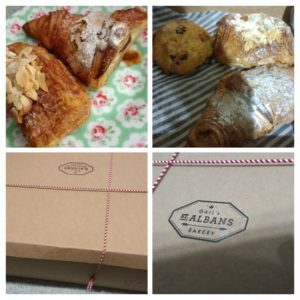 I usually go for the chocolate almond croissants, but they had a sour cherry and pistachio croissant so I got one of each (plus a scone for another time). I warmed them in the oven while I made the tea (Bluebird Bonfire Toffee tea) and then we had half of each. Mmmm, so good. 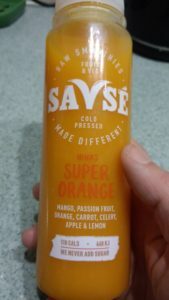 We then walked the long way to town (about 3 miles) and I had this tasty smoothie when I got home to give me a bit of a boost to power through some work. We had tea at Andy’s parents and then when we got home, it was finally time to use the log burner! We had it fitted in the summer but of course we needed to wait for a cold day to actually use it. 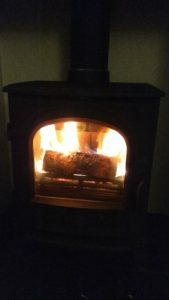 It was so cosy, and after getting so cold at parkrun, on my run and on the walks to town it was lovely to relax and feel warm- the perfect end to the weekend. 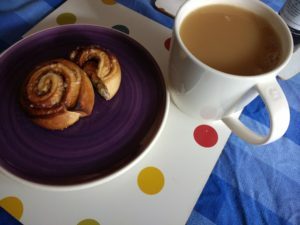 Do you have a different breakfast at the weekends? 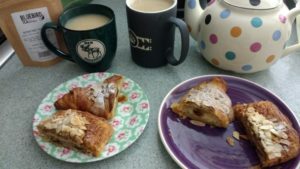 I’ll happily have porridge every week day in the winter and muesli in the summer, but I will often have something different at the weekend to make it more of an occasion and a bit more relaxed. Are you wearing gloves on your runs now? 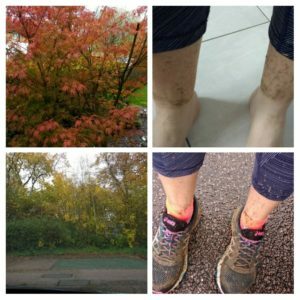 Author Maria RunsPosted on November 15, 2017 Categories General ramblings, Running, Stuff I love!6 Comments on A parkrun in the rain, getting cold and finally using our fire! I’ve done a couple of the parkruns in Brighton before (Hove prom twice, and Preston Park once). Andy (who is turning without being asked into my parkrun tourist planner- he found the hotel near Bushy, and that Andover parkrun was close to our hotel) noticed that Brighton and Hove parkrun is very close to Hove station, so we booked a hotel by Brighton station so it would be easy to get to. 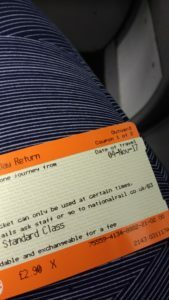 We arrived on Friday night and to save me the stress of the ticket machine in the morning (honestly, why do small things like this make me so stressed? I usually prefer to go to a person because then I know it’s the right ticket…), I bought my tickets the night before (there was an option for “travel tomorrow”), so all I had to do in the morning was get dressed and walk around the corner to the train. I could have run there as it was only a couple of miles, but as we were only there for the day I didn’t want to get back too late. It was £2.80 return so not too bad (I have paid that sort of thing for parking at a parkrun in some places). To be extra helpful (or because he knows I am not good at travel, who knows…) Andy had sent me a screen shot of the journey times to and from Hove station- I like to be there early so I got the 8.23 train which arrived in Hove at 8.26- nice and short. Luckily I left the time because for some reason, even though I had looked at a map, I thought that the parkrun would be closer to the sea than the station, so I knew that as the sea was on my left, I had to head downhill (or left). I had maps out on my phone with the pin in the centre of the park, and I couldn’t work out why I was getting further away. After realising I was going the wrong way, I headed back up the hill to the station, but then the map wouldn’t spin around so left on the map was right in real life so I got confused again. It turned out that there was a pedestrian bridge over the railway tracks, and once I had done that, it was an easy run up the hill to the end of the road, left at the end and the park was in sight. It was a bit damp, but the forecast rain hadn’t materialised yet. I could see a bunch of high viz people in the centre, so I headed over. It happened to be their 10th anniversary, so some people were dressed up. The RD called out for any new runners to head over to “the red vicar”- I think he was dressed as a cardinal? Anyway, the briefing was amusing (he checked we had our barcodes, then that we had the fiver for him…. )- and then it was time for the run briefing. Now, usually everyone listens carefully during this, and I feel that not only is it polite to do so, but imperative, because sometimes there are changes to the course or safety information to share. There were a lot of people there (461 runners), but I could not hear a word, so many people were talking. I was quite annoyed and found it really rude. The team give up their time so that people can enjoy a free and timed 5k, so the least you can do it be quiet for a few minutes during the briefing. There were pacers and they waved their little flag things about- I was near the 30 minute one at the start (but again you couldn’t hear at all). Once we started it was enjoyable- it sounds complicated but you start a little bit before the finish, doing one small lap and then two big laps. There is a little incline on each lap, but nothing too steep and then you have a nice long downhill at the end of each lap too. I try to make a point of thanking each marshal as I run past- I really appreciate them giving up their time to marshal, and I know that when I have marshaled it is lovely having the runners show their appreciation. One of the things I love about parkrun is hearing the call of “thank you marshal” echoing through the park. But I did not hear a single thank you from anyone else. Do people not do that at every parkrun? Anyway, I enjoyed the run and I think on the first little lap I caught up with the 30 min pacer, and then on the second lap I caught up with the next one (I can’t remember the number though- 29 or 28 mins possibly). I managed to push the pace on the final lap, doing a nice negative split with 27.43 (9.13, 8.37, 8.33 and 7.21 for the little bit- not the easiest to do on not a flat course). The best thing about lapped courses is that you get top 3 personal records on all the strava segments! It had started to rain quite heavily on the final lap, so I didn’t hang around at all- I took a few photos on my run back to the station. I was about to miss a train, but it was delayed by a few minutes so I still managed to catch it. By 10 o’clock I was sat in Cafe Coho- there was a lovely hot cup of Earl grey tea waiting for me, and the pancakes weren’t far behind! 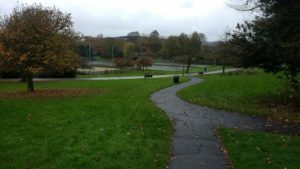 So another enjoyable Brighton parkrun (Bevendean Down parkrun is the one yet to visit, although that is a bit out of town so I am not sure I’d manage it without a car). I think probably Hove Prom is the easiest one for me to visit, but when it’s super windy it is nicer to head inland.